Ok, so the craziness of the last month is now over and I’ve no more travelling left to do. Annabelle and I have been to Devon, Cornwall, Derby, London and then back to Cornwall in the last four weeks but now we’re back we should be able to get into a bit of a routine. She will start Pre-School next month and I will have a few weeks to get things sorted before Baby no.2 arrives. I am: 30 weeks pregnant. 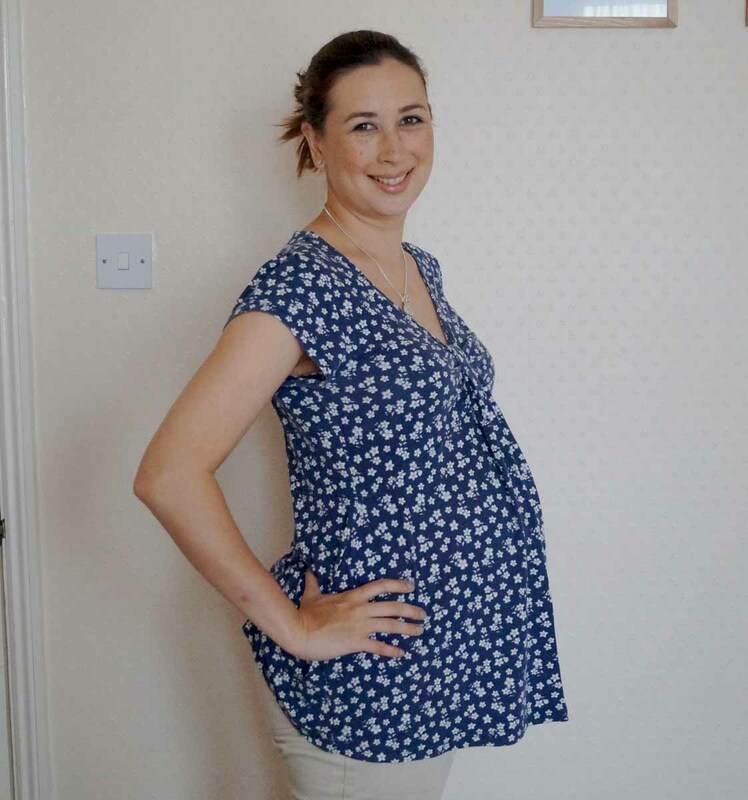 I’m wearing: JoJo Maman Bebe maternity tunic and cropped Capri trousers. This outfit was given to me by a friend who was pregnant this time last year. She would have been 30 weeks so there is a chance my baby is born on the same day as her daughter. I’ve gained: I have gained 7lbs/3kg weight since last week. 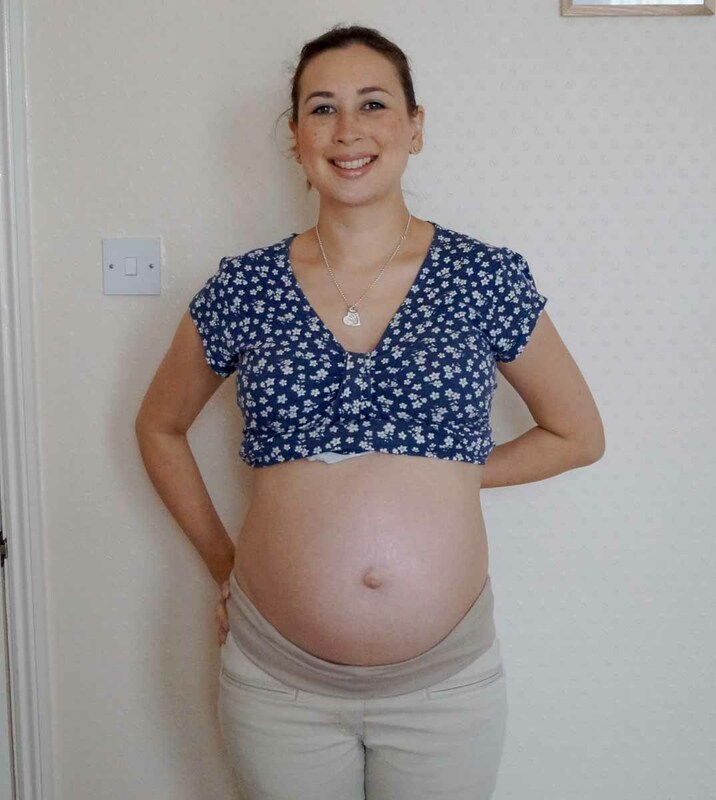 I’d lost 13lb/6kg through Hyperemesis gravidarum and gained 24lbs/11kg throughout my pregnancy. My midwife says that I’m only supposed to gain 20lbs/9kg by the end but I’ve gone over that already and have about 9 weeks left. Oops! How I’m feeling: With all the travelling, I’ve been tired but I’ve been trying to increase my iron intake as recent blood tests show that I’m anaemic. I’ve been prescribed pills by my doctor but I’ve also been drinking Spatone and eating dark chocolate, cashews and spinach. Other then that, I’m trying to just eat well and drink a lot of water. Highlight: No real highlights this week. Just trying to relax, put my feet up and get settled at home. The rainy weather has meant that I’ve not wanted to go out much but it’s not fair to keep Annabelle cooped up inside. The baby is: approx 1.3kg and I am definitely aware of that! It wriggles so much and can be incredibly uncomfortable. I’ve seen a foot shape poking out a few times and head or bottom shape quite often. Annabelle had a boney bottom and I think this baby does as well which makes it hard to differentiate between its top or tail! Food cravings: Sweet treats are my weakness at the moment. I crave fruit, chocolate and desserts. I’ve still got a taste for coffee (even decaf) and sweet drinks. Symptoms: Breathlessness is the biggie when walking around and going upstairs. I would like to be more active as I’m aiming for 30 mins of gentle exercise a day but I’m happy if I only make my target of steps on my Fitbit. 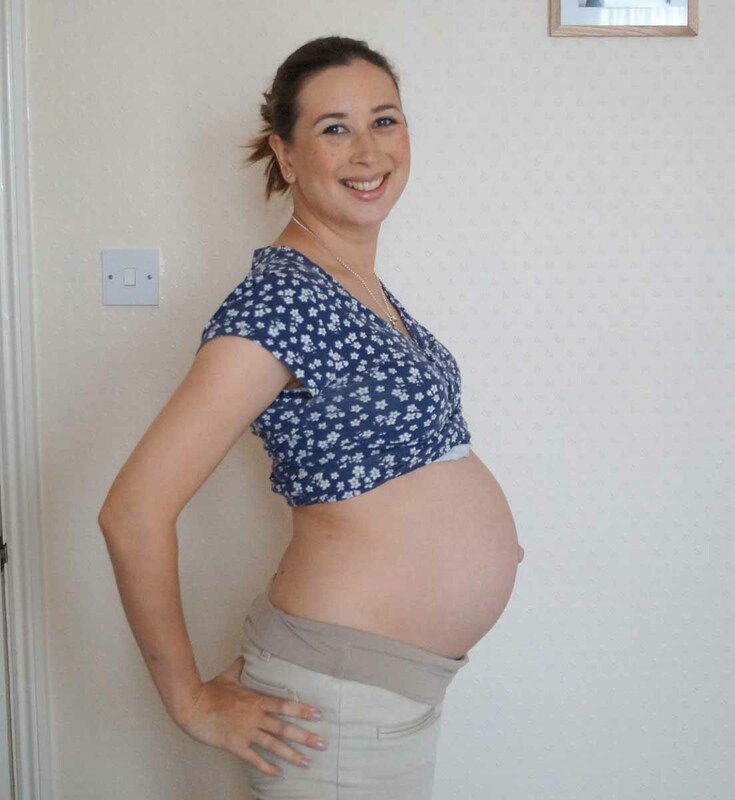 My body: The bump looks pretty big and is measuring slightly larger than during my last pregnancy. I’ve been told that the second child is usually bigger. It’s only by a centimetre but I’m taking that to mean that the baby will be a bit heavier when it arrives than its sister was. She was 7lbs 7oz. Any mood swings? Yes, I’m grumpy and irritable. I’m pretty tired and uncomfortable and my sleeping has been quite interrupted from vivid dreams. I’m looking forward to: Getting back into a routine. Taking Belle to swimming lessons where she will be in the pool without me for the first time! You are lovely. Thanks for the pictures. Had to laugh when you mentioned the foot poking… Happy for your family. Enjoy!